Discussion in 'Contrails and Chemtrails' started by Mick West, Jul 20, 2012. Off topic. I did see the original Facebook comment and it was quite vitriolic in its own way. However I think this does highlight how fragmented believers are and how organic the actual theory is. I feel sorry for Madison as she does get ridiculed on her radio show and now from fellow chemtrail believers. She takes pictures as true, especially presented by John Massaria, and then takes it further. However the nature of the conspiracy means that if anyone shows criticism or wants to correct information they are instantly branded as disinfo and shills, irrespective of who they are. I guess the geographical distance between people contributes to this. At the end of the day it shows how difficult it will be to disprove the conspiracy as there are going to be quite a large number of people believe it no matter what the evidence is. After I posted the origins of a couple of her pictures, she blocked me. I did not accept her friend request on FB. There is no way I would allow her to get access to my friends. I was scratching my head couldn't figure out who the heck everyone is talking about for a long time. She has me blocked and I've never even interacted with her. It's amazing how RIGHT these people feel, but they have to erase any dissenting voice. You can't really believe you're right, yet have the need of an echo chamber. That's all Madison Star Moon has. One day people will really "wake up", I hope. Otherwise we're going to have a lot of dangerous people with followings. Hi guys, I dropped by in Nov 2012 and vented my thoughts that “chemtrails” were a regular feature of the airscape. Ross Marsden and Jay Reynolds gave me some food for thought and I told Ross I would take some time to look at it, micro the bugger, then get back to him. I have reached a conclusion…for now. I don’t believe you could logistically mask a clandestine global operation that regularly puts aircraft over suburbia; someone in the chain would identify it as conspiratorial. I have spoken to commercial and private pilots and none buy the chemtrails scenario. So given that my only unresolved issue is the frequency and appearance of these persistent contrails. I am still not convinced that they were a regular occurrence throughout my life, as I mentioned I have been an amateur astronomer since my teens and for most of my life contrails were a rarity, now they are the norm. What has changed, the fuel mixture, the jet engine, the emission system? The increase in airline traffic combined with cooler running, and hence more contrail prone engines are probably the main reasons. There's also an increase in routes, so areas that had no contrails might now have some contrails. Or you might have moved. Aw thanks, sonofgloin, for getting back to us! Very much appreciated. I'll have to go back now, and have a look at the posts. I agree with TWCobra's and Mick's explanations for the increase in persistent contrails in the recent decades. It's getting very busy out there. I was an air traffic controller for 25 years. During my career i saw the average altitude flown by aircraft get higher and higher (into altitudes where contrails would form). When i retired, certain commerical/private jets were routinely pushing the 50,000 foot marker. You didn't see that 30 years ago. With the crisscrossing, it's just a matter of more planes today than in the past requiring more routes (FAA IFR Enroute Charts) and more aircraft today have incredibly accurate navigational systems that allows longer, direct point-to-point navigation which places the aircraft over locations not accustomed to seeing regular flows of air traffic. I remember reading a blog from a climate scientist and he made a comment that with increased traffic there will also be increased moisture on regular routes (from exhaust). I will try to find the blog but it made some sense. Hello I didn't read this entire post so apologies if I am repeating something. OK. I know and have seen that often planes fly 3 quarters of the way across the sky then just before the get to a lone cloud the CHEMTRAILS start. Just after the lone cloud the chemtrails stop. Thus many cartoons or hotel paintings have begun to depict clouds as having pointy ends and fluffy middles. Or numerous cartoons and animes have lines all across the sky representing clouds but actually being great depictions of chemtrails. Many of these animes take place in medieval times or other scenarios where airplanes are nonexistant. Columbia pictures the movie studios opening logo now has chemtrails in it. Hundreds of different poster advertisements are put into trains and other busy places with poster advertisements and depicting chemtrails seemingly without reason. Clears blue skies ofter have short chemtrails that have began and ended. Numerous photots and videos are around showing the planes either starting or stopping these chemtrails with a push of a button, or show and chemtrail plane and a regular plane in the same video or picture. Obviously the chemtrail planes trail expands and doesn't dissapate and the regular planes trail does. Anyone 6 years ago could watch all these thing regularily and easily though today the planes are more sneaky. For example spraying above cloud cover, or outside of the cities with the wind and weather conditions blowing the hazy clouds into the cities. Rainbows in the clouds are now observable where I didn't used the see them. This is because, recently, the makeup of clouds are sometimes artificial and man made. A really obvious thing is the shape of the Chemtrail often having bumps like protruding balls all down one side of it in a completely symetrical pattern fashion, likely caused by the dispense mechanism. This is not just talk. There are countless photos, videos, anime tv and cartoon clips, photos of advertisements etc to back it up. By the way the reasons chemtrails are depicted in the media as I have said above is to normalize it. This is a psychological technique so that children grow up seeing them everywhere thus it is normalized, then they never ask there mommy or daddy what are those lines across the sky. I like all the photos provided by the senior members. Thanks for those. However if you think your disproving chemtrails you may be surprised to learn you are doing the opposite. You've proved the technology is already here as well as the practical experience of filling planes with tanks to be used as chemtrail tanker planes. Remember just because one thing is proven true does not equate to another thing being proven false. They could both be true and your photographs prove it elequently. For example, just because I have pictures of a guns being used in a firing range, to test them and use them for sport, does not mean guns aren't also being used outside of the firing range to kill people. I hope I don't need to explain my metaphor further. I'm not trying to say chemtrails are used to kill people, but I'm definitely saying that global dimming seems from my experience to be happening. The amount of continualy cloudless skies, from morning to night, is way down from what it used to be, in my experience and opinion. I am not in a position to say why the chemtrails being sprayed worldwide, though I think they are likely multi functional. I do however have my guesses. Thanks and yes I can provide photos etc if necessary however, you could likely find any of these things on the net without too much trouble. A few examples of animes with obvious chemtrails, are Fairy Tail, Bleach, and dozens more. Any geniune person would likely come to the same conclusions as me if logical. Unless you have some sort of logical alternative explanations for everything I have said. Thanks for reading. Edit addition. Ps I have printed this page and if my post isnt accepted by the mods it will be highly suspicious. Thanks. Can you think of no logical reason why contrails should stop and start other than a button being pushed? I know and have seen that often planes fly 3 quarters of the way across the sky then just before the get to a lone cloud the CHEMTRAILS start. Just after the lone cloud the chemtrails stop. You have delivered the explanation with your observation. What is a cloud other than water (or ice) that becomes visible because the air can't hold it anymore as vapor? This in turn means that the air around the cloud is high in humidity, and that is the reason for the contrail to become visible as well - like a cloud. No trail = dry air. Trail = humid air. Thank you for your responses. To answer your questions. Yes if traditional contrails used to stop and start in the middle of blue skies and expand into large masses and start and stop over lone clouds in the blue sky then yes it would obviously been seen as natural. The problem is I don't remember that ever happening before in the past and unless you can prove it did, I think most peoples memories would agree with me. It seems like the lone clouds were targeted. Whether to hide the trail behind or to sort of cloud seed I don't know. My clear memories were natural contrails always follow behind planes like the wake behind a boat in the water. If you saw a wake start and stop unexpectedly behind a boat in the water you'd think it was strange and unnatural. The same is true for chemtrails starting and stopping suddenly in the sky so that these short chemtrails then remain for at least an hour and expand. With evidence like this the burdon of proof becomes that you would need to prove it's not happening because photographic and video evidence from the last century show this is a new phenomenom similar to the stunt pilots who start and stop colored smoke trails with the push of a button in aerial shows. By the way saw you on the New Joe Rogen show. Liked it. I think most peoples memories would agree with me. They don't though. People have all kinds of different memories. If you ask people when they first saw a persistent trail, then the date varies from the 1950s to 2013 (with a degree of "what, oh, I see one now"). Off topic but why would chemtrails stop and start? Has anyone tried to explain that? It would seem to be a very inefficient way to work. Probably "changing tanks" or something. Bored pilots, playing with switches in the cockpit? Thank you for your responses. To answer your questions. Yes if traditional contrails used to stop and start in the middle of blue skies and expand into large masses and start and stop over lone clouds in the blue sky then yes it would obviously been seen as natural. Can you explain why this cloud cover isn't complete and uniform? John Massaria has posted his version of the events which were moved to the closed thread. It is rambling and somewhat incoherent, as well as containing numerous inaccuracies and misleading statements. We need to recognize that there is no reasoning with people like this who are willing to knowingly pervert photos of ordinary equipment used to safety test passenger airliners to promote this hoax. These people are irredeemable, there is no cooperation with them, no sweet-talk, no explanation, and no changing them once they reach this point. They are morally bankrupt. All you can do is to fight them with the truth, backed up with documented facts. Their worst fear is the exposure of what they are doing, and they will make every effort to prevent that. Do not waver in your opposition, or else they and the lies they represent win by your default. Russ Tanner is still pushing it. That page lists no organisations that reject AGW. It simply states the facts, & some possible consequences. There was a good documentary on BBC2 last night (UK). "Jumbo: The Plane that Changed the World"
Of interest was the footage of the water ballast tanks. 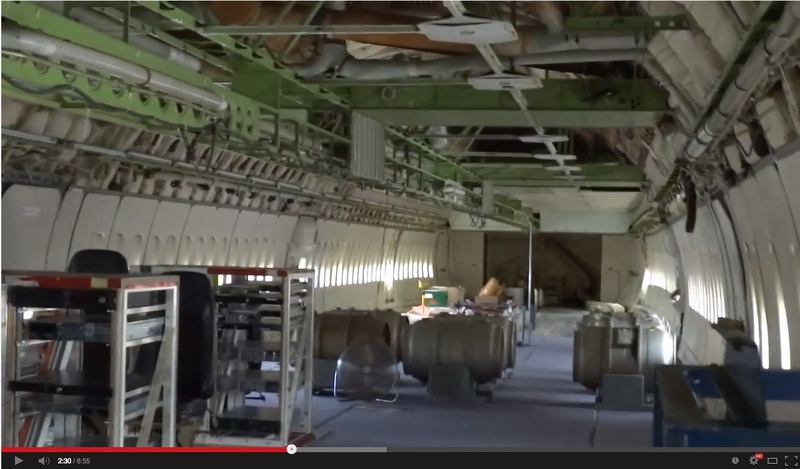 Footage showed the first 747 flight and the prototype on display at The Museum of Flight. Some of the interviews were conducted inside the prototype with the ballast tanks in the background. I wonder how many chemtrail believers watched the programme and recognised the tanks? Possibly the programme dispelled a few myths in relation to these tanks? The following footage from the Museum of Flight shows some of the ballast tanks. If you saw a wake start and stop unexpectedly behind a boat in the water you'd think it was strange and unnatural. It's very common rather than unnatural. The wakes of Ocean racing speedboats are not continuous but are regularly start and stop in nature. The bigger the swell the larger the gaps as the boats leave regions of high concentration of water (ocean) and encounter regions of low concentration of water (sky) This wave jumping on off wake characteristic of ocean racing boats may be interpreted by some as the boat-spray being switched on and off deliberately but in reality it's simply the result of the boat travelling at speed through regions of different wetness. Similarly different regions of wetness produce on-off aircraft contrails. Splashes from car tyres in puddles on a freeway are also analogous. In all cases the vehicles are simply travelling at speed and the on off visual effect is the result of localised conditions and nothing the drivers of the vehicles are doing. I know a lot of people who have no personal memory of seeing ocean racers and so it's possible they may tend to assume such racing never happened in the past but there is substantial documentation to prove it did. This is an important thread, since these types of photos are so often used to 'prove' so-called 'chem'-trail activity. this thread would be a good idea. Search that past the top part (which was pasted here in an earlier comment). Search the document for 'weather'. Realize that Evergreen is partially owned by the CIA so how many they 'sell' is a moot point. There are no less than FIVE mentions of weather modification. Now breathe because either way, there is nothing we can do about it. Rather off-topic. The thread is about the photos of ballast barrels, firefighting equipment, etc. The thread is about the photos of ballast barrels, firefighting equipment, etc. ... and their misrepresentation as "chemtrail" tanks, etc. Evergreen International Airlines (McMinnville, Oregon and Marana, Arizona) despite denials of rumors by senior management, in the waning hours of December 31, 2013, filed for voluntary Chapter 7 bankruptcy protection in a federal court in the state of Delaware. The company will be liquidated. RE: The patent you linked (yes, it mentions "barrels", so is at least tangentially related to this thread topic...a tiny bit). Again, primarily "cloud seeding" to induce precipitation. IF your sly admonition to "breathe easy" was meant as an attempt to bolster the non-existent trope of "chem"trails, then it did not succeed. There is a short piece on chemtrails in "SOCO" magazine (p.29) which uses the 1974 NASA vortex study picture and on the next page, a picture of ballast tanks. Geoengineering watch is linking to it. That single aircraft has been seen everywhere. Because it's no longer in existence? It's everywhere, worldwide, at the same time. Where have I heard this before? I know: it's Santa! Only he brings poison, not presents. But he's totally real, kids. It's everywhere, worldwide, at the same time. If I may just bring in some wisdom from the MH17/370 threads....you keep multiple copies of everything (there's another MH370 still in a hangar in Tel Aviv, remember? and another in the Indian Ocean and another just got shot over Ukraine). You keep multiples, so if one is seen doing something bad, you have the ALIBI of the other one(s) being very visibly somewhere else at the time. You can even get 2 doing the wrong thing and use them to alibi each other, as long as the wrongs are in different jurisdictions, ie the alibis won't clash in the exact same court room. Can you prove it was just the one plane? I will phrase my question to you this way. Why is cloud seeding a bad thing, and what are the negative effects or health hazards of it? We don't have to, sunshine. (Great alibi idea). If you believe it was more than one you'd better cough up some proof to show us how it wasn't. Or I'll tell you a story about where the monsters hide in your bedroom before you turn out the light. You need more sarcasm indicators in your posts. There are only three B-747s that operated with Evergreen Int. past the year 1997 (approximately when the "chem"trail hoax began to develop) and out of those three, one was a -400 model (visually distinctive by the extended-length upper deck). The registration numbers are links to further info. You can also type the N-numbers into a site such as http://www.airliners.net/ and http://www.planespotters.net/ to search for photo examples. If this isn't blatant I don't know what is. The first picture is a snapshot from the page CA Chemtrails, the second is of the original picture from the first page of this thread. They cropped it and posted it on their page. Maybe put metabunk watermarks on images posted here? It's on heaps of other anti-chemtrail sites, too. this is good PR for metabunk.